Supplied with 36" (91.4cm) ash handles and African hardwood heads now fitted with 12mm thick Tufnol end caps, a standard weight of 3lb (1361g) for Association Croquet and 2lb 14oz (1294g) for Golf Croquet with either a 10" (25.4cm) head length. Discounts available for orders of 5 or more. Supplied with 34" to 38" (86.3cm to 96.5cm) ash handles and African hardwood heads now fitted with two pairs of 6mm thick end caps. 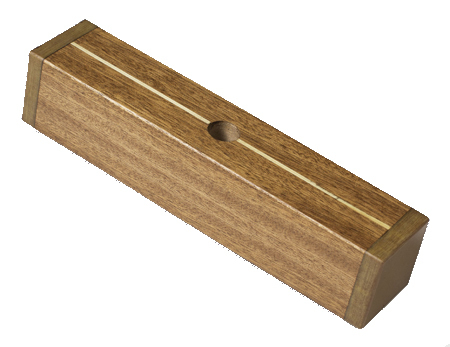 This mallet includes inner end caps that are screwed and glued onto the head making the mallet heads less susceptible to moisture and heat and therefore more robust. All other specifications are the same as the Type 1 Club Mallet. Discounts available for orders of 5 or more. Choose your head and shaft type from the options below. * CITES (the Convention on International Trade in Endangered Species of Wild Fauna and Flora, also known as the Washington Convention) is a multilateral treaty to protect endangered plants and animals. Many of the timber types I have used in the past have recently come under the CITES jurisdiction and have now become very expensive (up to 300% increase in the past 12 months), so much so that some timbers are now unavailable. The standard dimensions for a wooden head are 10" (25.4cm) long and 2 1/8" (5.4cm) wide. 11" (28.0cm) or 12" (30.5cm) head lengths are available and can be made to any width. All wooden headed mallets are weighted by inserting lead plugs behind the end plates, thus placing the maximum weight at the ends of the head. Please specify your desired total mallet weight. This system allows the player to easily adjust the weight of the mallet adding or removing any number of six lead discs, each weighing approximately 0.75ozs. It is only available for mallets with a carbon fibre shaft. Please specify your required base weight which will allow a change of weight of +/- 2ozs. A standard shaft length is 36" (91.4cm) with a cross section of 1" (2.5cm) x 1 1/8" (3cm) but any length or cross section can be made for a small surcharge. Produced from seasoned, straight-grained American Ash. Ash shafts weigh aproximatly 13ozs. This lightweight material is extremely strong and is available with the below options. An octagonal, hollow, straight-grained Pine handle fitted on the carbon fibre shaft. The handle is lightweight and very strong, giving the mallet a low centre of gravity with an easy swing and ideal for those players that prefer the feel of wood or a tape grip. This shaft weighs approximately 8oz (227g). This carbon fibre shaft has no Duplon grip on the lower section and has an aluminium socket. This shaft is popular with Golf Croquet players. This shaft weighs approximately 5 1/2oz (156g). A full-length carbon fibre tube fitted with a lightweight octagonally shaped Duplon foam handle. This shaft weighs approximately 6 1/2oz (184g). 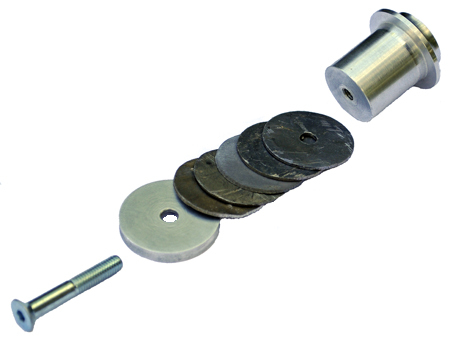 All these shaft types are removable, rotatable or changeable. Duplon available in black or mauve. Similar to the CF8 but with a full length Duplon grip. A full-length carbon fibre tube fitted with either solid natural cork grip ('n') or re-mastered granular cork ('g') upper with a Duplon lower grip in the traditional style. Similar to a CF10 (n or g) with a continuous lower Duplon lower grip.